In December 2016, the North American heavy duty lubricant market witnessed its biggest specification overhaul in history with the launch of two new API heavy duty diesel engine oil categories: CK-4 and FA-4. fuel efficiency for mining fleets. Formerly known as Proposed Category 11 (PC-11), the introduction of API CK-4 and FA-4 engine oils was designed to address North American greenhouse gas emissions legislation, drive improvements in fuel economy and deliver greater engine protection and performance. At Petro-Canada Lubricants, we believe these new oil categories present an opportunity to improve the carbon footprint of mining businesses, reduce equipment downtime, deliver savings through lower maintenance costs and increase the productivity and profitability of mining operations. As with all business decisions, clear understanding and early adoption could result in a genuine competitive edge. What is different about the new oils? The heavy loads experienced by mining equipment on a daily basis put engines under strains that can stress conventional lubricants; leading not only to engine wear, but even failure. In any mining operation, downtime costs are destructive so using a quality lubricant to protect your engines is crucial. Compared to their predecessors, API CK-4 oils are more robust and resistant to oxidation. This has become necessary in recent years as newer engines are designed to run at higher temperatures in order to improve operating efficiency. However, higher temperatures accelerate the rate of oxidation and oil thickening. This increases oil viscosity and can lead to deposit formation. The result is that the oil degrades and its ability to flow is reduced, thus decreasing engine protection and negatively impacting engine fuel efficiency. 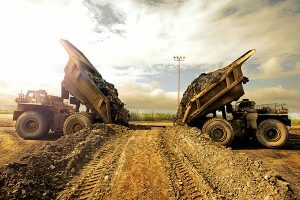 Of particular relevance to mining fleet operators, the new oils are also designed to improve resistance to aeration and provide increased shear stability. Improving aeration control (i.e. resistance to foaming) is important for off-road engines where, in some cases, more air than usual could become entrained in the engine oil. A high level of air entrainment is dangerous, particularly at the bearings where maintaining a suitable oil film is critical to protect them. Taken together, these design improvements provide enhanced performance, greater hardware protection, and may reduce vehicle downtime – a major source of financial drain for operators. However, it is crucial that mining fleet operators understand which sub-category is most suitable for their vehicles. API CK-4 licensed oils are fully backwards compatible allowing for their use in the vast majority of older diesel engine vehicles that ran previous oil categories (CJ-4, CI-4 Plus, CI-4, etc.). Moreover, users can benefit from the increased robustness of CK-4 oils over the previous CJ-4 oils, enabling increased performance and protection gains. Meanwhile, API FA-4 oils have a considerably lower viscosity (specifically lower high temperature high shear – HTHS – viscosity), meaning less friction and less viscous drag in the engine. This enables a reduction in fuel consumption, all while continuing to offer increased levels of wear protection. These oils have been specifically designed for use in select high-speed four-stroke diesel engines designed to meet 2017 model year on-highway greenhouse gas (GHG) emission standards. As such, FA-4 oils are not expected to have an immediate impact on mining fleets and many of the North American off-road original equipment manufacturers (OEMs) have stated their intention to continue utilizing engine oils with traditional viscosity characteristics. This means API CK-4 is the oil category of choice for mining fleets. What kind of drain interval benefits can be expected? The new oils provide extended drain capabilities even better than their API CJ-4 predecessors. However, actual oil drain intervals will depend on the severity of service and type of application. With proper used oil analysis, drains can be extended within certain limits, minimizing costly downtime. As best practice, end users should refer to their engine owner’s manual and utilize oil sample analysis data when exploring whether and how far to extend drains for their operations. At Petro-Canada Lubricants, we see the new era of API CK-4 engine oils as not only an opportunity to improve the efficiency and carbon footprint of mining fleets, but also a chance to recognize the potential to cut costs and increase profitability. Formulated using leading-edge lubricant technology to combine the best additives with some of the purest base oils, Petro-Canada Lubricants’ Duron Next Generation has been engineered to meet and exceed the advanced OEM engine performance requirements for ultimate protection and fuel efficiency. We have introduced a clearly differentiated product line to help our customers choose the product best suited to their particular needs. For more information, please visit: www.Duronthetougherthebetter. Brian Humphrey is OEM technical liaison at Petro-Canada Lubricants.